Tour name: Hanoi city tour one day trip. Ho Chi Minh Mausoleum and Museum. Literature Temple and Quoc Tu Giam. Sword Lake (to visit Ngoc Son Temple). Our car and guide will meet you at 8.00 am at your hotel. Our tour will start by Our tour will start by visiting Ho Chi Minh Mausoleum and Museum. The mausoleum is the last resting place of Ho Chi Minh, Vietnam’s great revolutionist. It is a symbol of gratitude and respect of Vietnamese people for president Ho Chi Minh. The Ho Chi Minh Museum is the preserver of everything memorable related to Ho Chi Minh. The Museum consists of five extensive floors and was inaugurated on 2nd September, 1990, celebrating the 100th birthday occasion of the beloved President. Close by, the famous One Pillar Pagoda is worth a passing look. 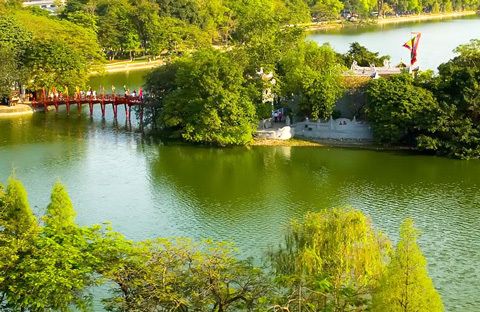 Built by King Ly Thai To in 1049, the structure has become an important symbol for the Hanoi. After that, we will continue to visit the Literature Temple and Quoc Tu Giam – Vietnam’s first University, constructed in 1070. Its gardens and well-preserved architecture offer a relaxing glimpse into Vietnam’s past. When you finish your lunch at a local restaurant, we will proceed to Vietnam Museum of Ethnology. This is the most recent yet probable the largest and undoubtedly the most interesting museums in Hanoi and Vietnam. This is worth a thorough visit, for those who are keen to learn about the multiculturality of Vietnam and for those who would appreciate some green space. Then we will stop at Sword Lake to visit Ngoc Son Temple and learn more about the lake’s legend. Our trip will end right after. Insurance in all days tour. I am interested in doing the one day superiour tour on August 30,2014. How much this cost for 2 aduslts. Price for 2 adults = $70. All include ^_^.